Playing in lineups with the likes of Hank Aaron, Eddie Mathews, Roberto Clemente and Willie Stargell, shortstop Johnny Logan was a batter the Cardinals learned to respect. In 1957, when Logan was the starting shortstop for the World Series champion Braves, he reached base in seven consecutive plate appearances against the Cardinals over two games at St. Louis. During a 13-year major-league career (1951-63), Logan batted .282 against the Cardinals and had 209 hits in 209 games versus them. He hit especially well at St. Louis, posting a .309 batting average there in 102 games while playing for the Braves and Pirates. On May 10, 1957, Logan, batting sixth, went 4-for-4 with a walk and five RBI in the Braves’ 10-5 victory over the Cardinals. In his first two at-bats, Logan produced a two-run double and a RBI-single against starter Sam Jones. The next day, May 11, Logan, in his first two at-bats, had a RBI-double and a single off starter Lindy McDaniel. Logan had reached base in each of his first seven plate appearances of the series. A month later, the Braves acquired second baseman Red Schoendienst from the Giants. The former Cardinal paired with Logan to form an effective keystone combination. 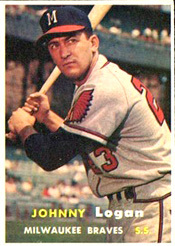 Logan remained the Braves’ starting shortstop through 1960 until he was replaced by Roy McMillan. In June 1961, the Braves traded Logan to the Pirates for outfielder Gino Cimoli. Logan primarily was a utility player and pinch-hitter for Pittsburgh. One of his last big hits came against the Cardinals. On July 16, 1962, Logan started at third base for the Pirates at Pittsburgh. In the sixth inning, with the Cardinals ahead, 2-1, the Pirates loaded the bases with two outs against starter Ray Sadecki.